AW: How were you first introduced to wakeboarding? GO: My mom waterskied at her family’s lake house in the summer and my dad was a show skier at Sea World. When we went to the Masters one year we picked up my first wakeboard. AW: How has moving to Orlando helped you progress? GO: Moving to Orlando has done so much for me on the cable and the boat. Living with Mike Dowdy and riding with people like Cory Teunissen and Meagan Ethell has helped my riding and my style so much! Riding at OWC all the time has been great because all the riders there are so good and always down to help push you in the right direction. AW: What’s the wake scene like back home in Ohio? GO: The wake scene is surprisingly good! With WakeNation Cincy right down the street, there are a couple of up and coming riders who kill it! There aren’t too many younger kids who are riding boat though, but all the OG guys from Cincy MC still go out and throw down! AW: What keeps you busy when you’re not riding? GO: This winter I did a lot of snow skiing, but usually I just hangout at the cable, hangout with friends, and occasionally beat Robby Holihan in NHL ‘15. AW: Who do you typically ride with in Orlando? GO: Meagan Ethell, Jake Pelot, Taylor McCullough, Jamie Lopina, Robby Holihan, and the Aussies. AW: What is your favorite place wakeboarding has taken you so far? AW: Who is your favorite boat rider and cable rider to watch? GO: My favorite boat rider to watch is Dowdy. He goes big and is always coming up with new, mind blowing tricks. My favorite cable rider to watch is Johnnie Paul. He’s one of the local riders from WakeNation and has some of the best style I’ve ever seen. GO: I’m really trying to show that it’s possible to be competitive in both cable and boat at the same time. A lot of riders only focus on one or the other, but I think you should be able to kill it no matter what you’re riding behind. AW: Spinning(1080/1260’s) or double flips? Why? GO: Spinning. I think there is a lot more going on in a 10 than there is in a double, therefore making it harder. But doubles are definitely cool! AW: What are your plans for 2015? GO: My plans for 2015 consist of traveling more than I ever have before, cleaning up my rank in the Nautique series to qualify for Masters, and getting an overall podium for the Wake Park Triple Crown. 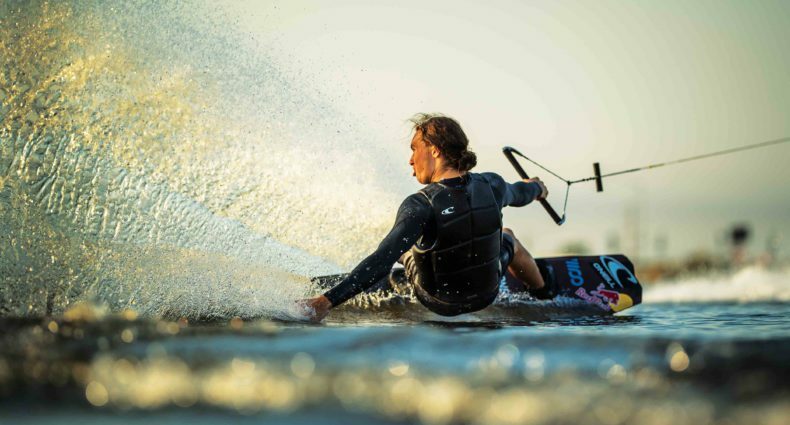 AW: What is the best trend right now in wakeboarding? GO: Sick events like Shredtown Jamboree and X-Games Real Wake; those contests are what is pushing the sport. Also private 2.0 parks. AW: What is the best nickname someone has given you? GO: Goonter. I don’t really have any nicknames. AW: Best hype music before you go ride? GO: Led Zeppelin, Kanye, maybe some Timmy Trumpet. AW: Any thanks you’d like to send out? GO: My Parents, Dowdy, Pork Chop, Liquid Force, Midwest Shades, WakeNation Cincinnati, and Cincinnati MasterCraft.